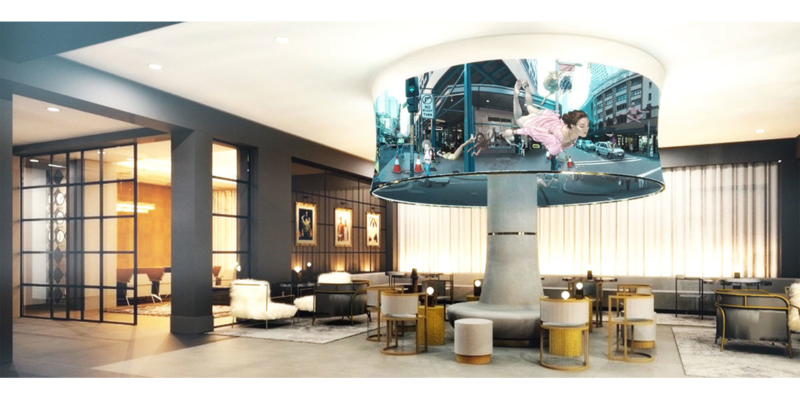 Rendering of the twelfth floor of the Angard Arts Hotel, which features a 360-degree video art installation. Photo provided. The long-awaited Angad Arts Hotel (AAH) opens in Grand Center Arts District just up the street from the Arts and Education Council’s (A&E) incubator, the Centene Center for the Arts, this November. AAH holds a strong commitment to the arts and hopes to inspire surprise, delight and joy. From the entry to the twelfth-floor lobby, guests see art throughout their journey. Once inside, guests walk through an art gallery featuring the work of St. Louis regional artists. Artwork is available for purchase at various price points so all guests will be able to take home a piece of St. Louis with them. Artwork for the hotel was selected in partnership with regional visual art organization Art Saint Louis, which will work with the hotel to cultivate year-round programming. 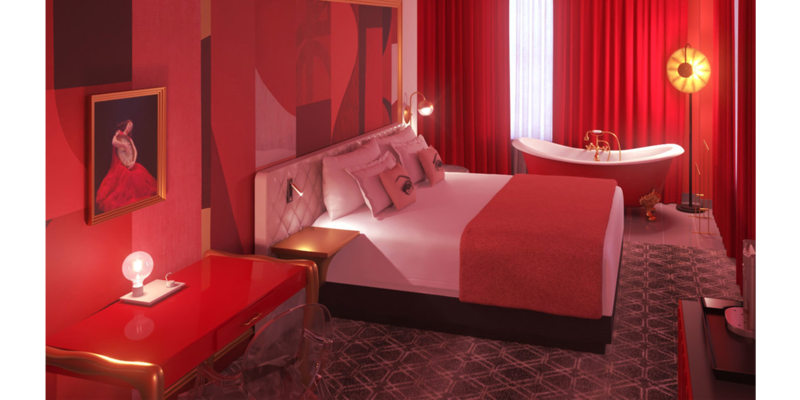 Guests can select their room from four mood and color options: happiness (yellow), tranquility (blue), rejuvenation (green) or passion (red). Artwork for the headboards created by local artists Albert Yowshien Kuo, Megan Rieke, Dail Chambers and William LaChance brings these themes to life. Inside the rooms, artwork by local artists reinforces the themes. Guest will also notice signature scents and corresponding playlists connected to their mood. The artistry is even seen in the details of AAH. There are pillows created by Paula Hainszewski, guest room numbers created by Jacob Elior Berkowitz and the design on the staircase mirrors a pattern on the outside of the building. Even the uniforms worn by the staff were designed by Reuben Reuel, who was in the inaugural group of designers in the Saint Louis Fashion Fund’s (an A&E grantee) incubator. Video content was created and curated for the 360-degree video art installation on the twelfth floor by Director of Video Art and video artist Zlatko Ćosić. AAH plans on bringing art with various performing arts, some planned and some seemingly spontaneous to the guests. But, the hotel wants guests to enjoy the art just outside their walls as well. The library, which also serves as a meeting space, will have books and information about arts and culture within Grand Center. Angad Arts Hotel is offering ARTS Card holders 20% off best available room rates, learn more here. For more information about the Angad Arts Hotel visit angadartshotel.com.